Tag Heuer has a long history of excelling in sporty watch-making, and is often associated with the Olympic Games and athletics of all kinds. The Tag Heuer Formula 1 Chronograph 42mm Watch CAU1116.BA0858 continues this tradition with its time-keeping abilities and athletic look, perfect for anyone who is in training for an athletic event. This watch was designed with athletes in mind, so many of the functions will be useless to the non-active buyer. If, however, you are an athlete, this piece features several functions which will be of particular interest to you. The tachymeter function helps to measure your speed so you can always be on top of your game. The scratch-resistant and water-resistant features provide a durability that is necessary when you are active and on the go. There is a date function at the 4 o’clock position, as well as three sub-dials around the 6 o’clock position. These sub-dials can be used as stopwatches, and measure one-tenth seconds to assist in training. The double security clasp helps to ensure that the watch stays put during a run or any other activity. This watch is designed to undergo stress and is meant to be used as a tool rather than as a simple accessory. While this watch is perfect for an athlete, for a person who simply needs to know the time, it seems excessive and overpriced. At a retail price of $1,700.00, this piece is a must-have for any serious athlete. However, it is an extremely specialized watch, geared specifically towards athletes. The tachymeter and lack of numerals on the face could make this a confusing watch to read for the average buyer. There are a lot of numbers that would not mean anything to a non-athlete buyer looking for a watch that simply tells the time. 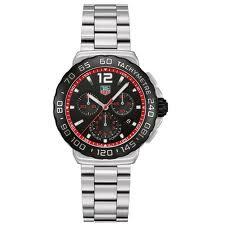 A non-athlete would do better to avoid the Tag Heuer brand altogether in order to find a brand more suited to their needs.